Some of the things that I appreciate most about Erskine are the ministry opportunities that occur throughout the year. During this past year, students, faculty, and non-Erskinites alike all played parts in benefiting the community, whether by raising money for the American Cancer Society through the Miss Erskine Pageant, by volunteering at an Eagle Scout’s project, or by participating in any other numerous ministry events. For me, the most memorable ministry opportunity of my freshman year will always be the RUF-hosted Barn-K For Joy. 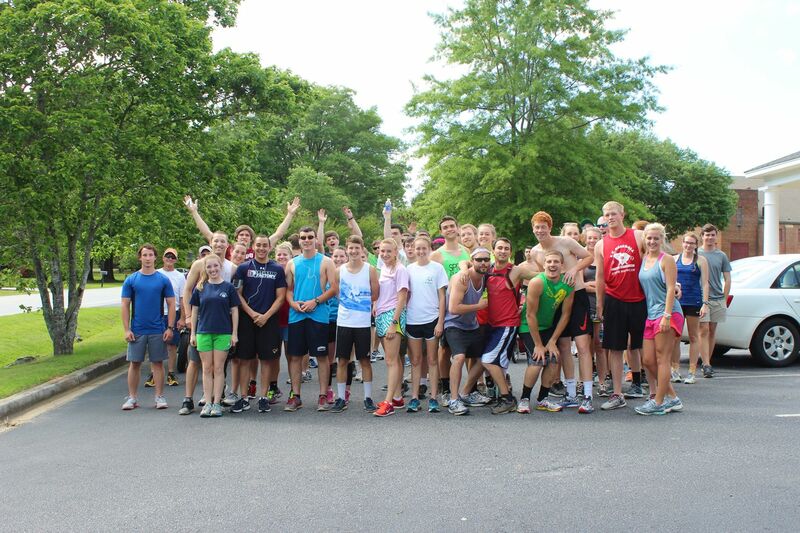 The Barn-K for Joy raises money to send a young man to Camp Joy, a camp that is specially designed for people with special needs, through a 3.6 mile race from the Due West sign in Erskine to the barn where RUF meets on Sundays. Paul Patrick, the campus minister at Erskine, finds sponsors who will donate a certain amount of money depending on the number of participants in the race. RUF has been able to send a special young man named Warren Sullivan to Camp Joy for many years, and I think that is one of the most special things about the ministry and about Erskine. Now, not all people are created equally in the aspect of physical fitness. Take me, for example. I enjoy going on “runs” (much walking occurs), but I am definitely not a “runner.” After I passed the first mile marker on the road, a part of my heart sank because I was so tired and still had more tan two miles left. Other [crazy] people are super fit and love to run, so they leave people (like me) in the dust. Some people hate running with a passion and enjoy a leisurely stroll instead. No matter what category a person falls into, he/she is guaranteed to really enjoy the Barn-K because it’s designed to accommodate to all types of people. Plus, everyone gets rewarded at the end of the race with a buffet of water, fruit, pizza, and snow cones, a super cool t shirt, and an amazing lesson by Paul Patrick! After telling you about my wimpiness and how tired I was from the race, I would like to say that passing the finish line was the best feeling that I felt that day, but despite a grand feeling of relief and accomplishment, I experienced an even better feeling later on. Warren Sullivan got to come to RUF with some of his friends and caretakers on the day of the race. Warren’s uncontainable excitement was almost tangible as it filled the entire barn. I remember sitting on the hay bale and feeling more joy and thankfulness than I had felt in a long time. This time, my joy did not come from the blessings that God had given me, but from the blessing that God gave to Warren, through us. I was completely overwhelmed because I could almost see Christ lovingly watching Warren, his blessed and beautiful child. The Barn-K for Joy was so aptly named, not just for the camp, but because everyone experienced inexplicable joy as we watched Warren’s reactions to Christ in his life. That’s how I had always viewed music, the good notes that live and breathe and play to describe people’s lives and situations. It was something easy, soothing, soul thrilling, and life-inspiring. All that was ever required of me was to hear a song, listen to it, fall in love with it, and then sing it. Nothing more and definitely nothing less. Until I walked into Erskine Choraleers, Fall of 2010, unawares and unarmed-who knew you needed a pencil for music? A seat was assigned, a pack of music was handed to me, and in walked a man who would forever change not only my life but the way I viewed and interpreted music. The memory, though present, is slightly blurred. He held a pencil in hand and commanded us to stand. “Open your pack and pull out….” all I heard was Bach. That sounded familiar. Glancing to my right I watched to see which piece of music my fellow alto selected and did the same. Then I made the terrible mistake of opening the piece to reveal a sheet of paper on which an enormous ant hill had exploded. I’m sad to inform there were no survivors. Where was the music? You know, the part where I get to hear what I’m singing before I’m forced to sing it? Lost, disoriented, freaked out…are just a few words deemed worthy of describing how I felt. Carry over? Leaning over and whispering barely above a breath, I asked the alto to my right, “What’s a carry over?” I will never forget her reaction for it was the disbelief in her jaw drop, the roll of her eyes, and the sad truth in her voice that made me feel inadequate and unworthy. She made it sound so simple, so easy. My ignorance of sight reading could be overlooked, but not having the capability to understand a carry over was unacceptable! I was unfit to be in the same room as the rest of them; I did not deserve the title of Choraleer. I’m just going to pack up and come home, Mama. I can’t read music…I didn’t even know what a CARRY OVER is! Amid sobs, To learn music. Well, tomorrow and every day after that I learned that music is more than a melody we love and cherish. It is a full time commitment to a level of excellence that only a few get to experience much less achieve. Sometimes music isn’t only about “the good notes.” Sometimes they are sad, minor, dreadful moments of dissonance that collide, crash, and magically resolve. Sometimes music must first make us feel lost before we can be found. Life lessons learned at Erskine that have managed to find their way into the new steps my life has taken. Day one as a Chorus Teacher felt very much like day one as a Choraleer: the almost end of my journey….almost. And I will, my friends. I will. If ever a moment could be bottled away for a rainy day, I would that it be the moment this blonde haired, blue-eyed wonder of a human chose to share with me a piece of his happiness. Music, as I often find myself expressing to my students, should not be based solely on how it appeals to us or how it entertains, rather pleases our senses. Those are all wonderful aspects of Music which allow us to enjoy its many gifts. But there is a rather complicated and yet beautiful mystery to what Music does both in us and for us when used as a means to lift the fallen; or in my case, a rag time to revive a worn out teacher. Prior to dismissal, my students posed a query concerning the many trophies that line a row of storage units in the far corner of the room. The most recent prize is dated at 2009 for their Gospel Choir and 2007 for their High School Chorus, more than 6 to 8 years ago. The students (being Freshmen) were alarmed to learn that other than a plaque for excellence from a Choral Festival, the remaining members of our Chorus did not have much of a legacy to leave behind. It swept silently and swiftly across their faces: this would be their fate. And a moment was born. So, what will be your story? Will you be the random, musical genius who tickles the ivories with some rag time treasures? Will you be the teacher looking for moments to birth? Or perhaps you are the soul dreaming of a legacy you think is out of reach?